The gas station I usually go to added a discount for cash. The prices posted high on the board are cash prices. Down at the street level, there is a small pavement board listing the prices for cash and for credit in two columns. 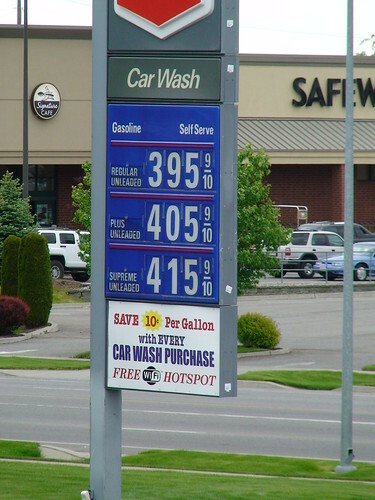 For regular unleaded gas, the credit price is about 3% higher than the cash price. The lower cash price also applies to debit. If you are not getting at least 3% rewards on gas from your credit card, you might as well use your debit card. The station actually gets less money if you use debit because its credit card processing fee is usually less than the 3% discount it offers straight up. It’s trying to wean people off the habit of using credit card for gas. If you still want the credit card rewards, is there a way to pay the discounted cash price and still get the credit card rewards? Call in the universal adaptor: gift card. You buy a gift card inside the store. Then you use the gift card to pay for gas outside. Once the money is on the gift card, it doesn’t remember how it got there — cash or credit. You get the cash price if you pay with a gift card. If it’s a station you always go to, buy a large gift card so you don’t have to come inside all the time. If you have a small amount left over on the card after using it a few times, you can either top it off or trade it in for a new gift card inside the store. Note if your credit card gives a higher reward for gas than for other purchases, the higher reward percentage may not apply for purchases inside the store. Gas paid at the pump (“automated fuel dispensers”) and purchases inside the store fall under two different merchant categories. Some credit cards give the higher reward percentage to both categories; some only give it to gas paid at the pump. In the latter case you would still get the regular rewards for purchases inside the store. You just have to try it out to see how it works for your card and the gas station you go to. Gift cards are not just for gifts. They are a very useful tool for getting lower prices. Nice hack! I hadn’t thought of that, but it makes a nice workaround to add on points and get cheap gas. Not in Oregon. I purchased a few Union 76 gift cards for my kids and to my surprise they all charged credit card prices when using them. I called the issuer to complain and they said it is against federal law for them to set gas prices. How deceptive, of course they can not set gas prices, but buying a gift card with cash implied cash price on purchases to me. I used Shell Gift cards at the Shell station and they charged the credit price. This is. It fair as the money is already directed to Shell.